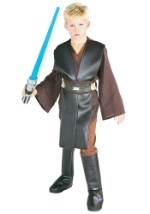 Get this boys deluxe Obi Wan Kenobi Halloween costume from Star Wars for a powerful Jedi Knight costume. Our kids Obi Wan Kenobi costume includes a polyester shirt that ties around the back of the neck, pants with an elastic waist, a belt, and attached boot covers. Add Obi Wan's lightsaber and a kids deluxe Jedi robe for a completely authentic look!